St. Luke. Evangelist & Gospel Writer - My Catholic Life! Saint Luke was one of the four Evangelists but not one of the Twelve Apostles. Like Saint Mark, Luke was not among that select group who walked step by step alongside Jesus as he journeyed through Palestine. Luke was more likely a disciple of Saint Paul, who mentions a Luke who accompanies him on his missionary journeys. Little is known with certainty of Luke’s life. What is known is that he wrote over a quarter of the New Testament, the Gospel of Luke and the Acts of the Apostles. The two volumes of Luke-Acts are foundational works for knowing Jesus Christ and the early Church. The third Gospel does not name its author and does not even claim to be an eye-witness account. But the earliest known manuscripts of the third Gospel are attributed to Luke, and even Saint Irenaeus of Lyon, writing in the late second century, names Luke as its author. Every one of the four Gospels has a unique perspective, is written for a specific audience, and relates certain details and stories the other Gospels do not. Saint Luke likely wrote for a non-Jewish crowd, as he translates all the Hebrew and Aramaic terms that the other Gospels leave in their original language, with the assumption that Jewish readers would understand them. Luke alone tells the story of Lazarus and the rich man who repents of having ignored him. To Luke alone do we owe our knowledge of the Incarnation. It is as if he is just behind the young Mary in the room when the Archangel Gabriel announces that she will be the Mother of God. Only Luke writes down the Virgin’s Magnificat and gives us the scriptural basis for the “Hail Mary.” Yet in all of this, Luke himself does not appear. He must have been humble, because he recedes into the background while the whole cast of the Gospel steps to the fore. Luke’s Acts of the Apostles is a diary of the very early Church. Acts is often told from a first-person perspective with the use of the word “we.” Without this journal there would be huge gaps in our knowledge of the incipient Church. It is to Luke, especially, that we are indebted for our knowledge of Pentecost and the workings of the Holy Spirit on the Apostles. Luke is clearly on Saint Paul’s missionary team and remains at the great evangelist’s side until the bitter end. When Paul is imprisoned in Rome, with his beheading just over the horizon, he is abandoned by all his coworkers save one. From his prison cell Paul writes “Only Luke is with me” (2 Timothy 4:11). Saint Augustine writes in the Confessions that the present tense of past things is called memory. The past is not really the past, then, if we remember it accurately. Memory can be ill-used when it carries a grudge and blocks forgiveness, when it doesn’t let the past recede, allowing it to invade the present so forcefully that no one is allowed to grow, but instead remains forever defined by their worst five minutes, not matter how long ago they transpired. Understood in a healthy way, memory makes the good past live again. When committed to writing, memory makes the past forever present for posterity. The written Gospels make Christ come alive. Their pages are not Christ in full. No one can be reduced to their documentary trace. But the Word made flesh, the Word alive today in heaven, was captured at a certain moment in time by the words of Saint Luke. Christians believe that the Gospels capture the essentials of the life of Jesus Christ which God desires the faithful to know. And when these Gospels are read in the light of the living Gospel of the Church, and supplemented by the grace of the Sacraments, the witness of the saints, the governance of the hierarchy, and the teachings of the Catechism, we have all that we need to achieve heaven. 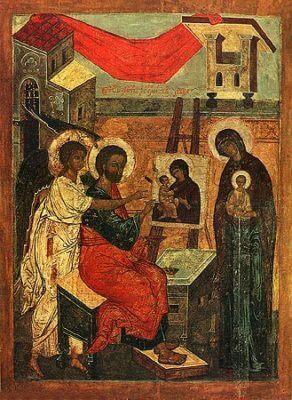 The Evangelists make the original events of the life of Christ present today. Without these inspired records, God would not cease to be God, but He would be less vivid to us living so many centuries later. Saint Luke, your words preserving the life of Christ make Him knowable and lovable to the world today. Through your intercession in heaven, we ask that the riches of your Gospel, especially your words about the Blessed Mother, may inspire us to be more faithful disciples.